Photographs by Jonathan Elderfield. Text by Murray Dubin, W. S. DiPiero, and Jonathan Elderfield. Kehrer Verlag, Heidelberg, In German and E, 2003. In Germany. 120 pp., 54 duotone illustrations, 9½x8". 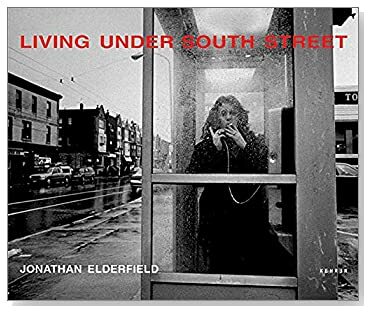 Showing Elderfield's distinct view of South Philadelphia, this book documents a big scope of 'street life,' ranging from snapshots to carefully composed pictures. These beautiful black and white photographs strike the eye because of their lyrical quality, which is enhanced and complemented by contemporary poems. Due to this interdisciplinary conception, we find a great deal of authenticity in the street scenes, yet there is enough room for our own imagination to go beyond the captured moment. Extremes of poverty as well as healthy middle class are shown, in all variety of cultural heritage that is manifested in the resident's appearances.